Self-driving cars and trucks might get all the attention, but they aren’t the only vehicles letting AI take the wheel. 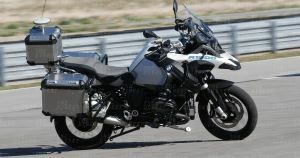 On Tuesday September 11, BMW released a video (below) of its self-driving motorcycle in action. In it, the driverless motorcycle starts its engine and then takes off down a track. It accelerates and makes turns all on its own before returning to a complete stop. The best part: the tech powering the motorcycle could one day keep bikers safer on the road. As BMW engineer Stefan Hans notes in the video, the company never actually set out to create a self-driving motorcycle — it just wanted to figure out ways to improve motorcycle safety for riders the same way lane-keeping and autonomous braking systems help keep car drivers safe. The idea is that autonomous features could pick up the slack if a driver isn’t paying enough attention to the road. Still, it’s not hard to imagine motorcycles one day joining the growing fleet of vehicles making deliveries sans drivers. After all, they’re lighter than cars, and therefore more fuel efficient. Plus, who wouldn’t enjoy the novelty of seeing a bike like the one in the below pull up to drop off their pizza order?